A group of ten firefighters and an expert from the Home Front Command arrived in Addis Ababa, Ethiopia on Sunday to help with the wildfires that have been burning for two weeks in the Simien Mountains in the north of the country. The current fire has proved difficult to extinguish because of the rugged terrain. One member of the group is an expert in aerial firefighting techniques. 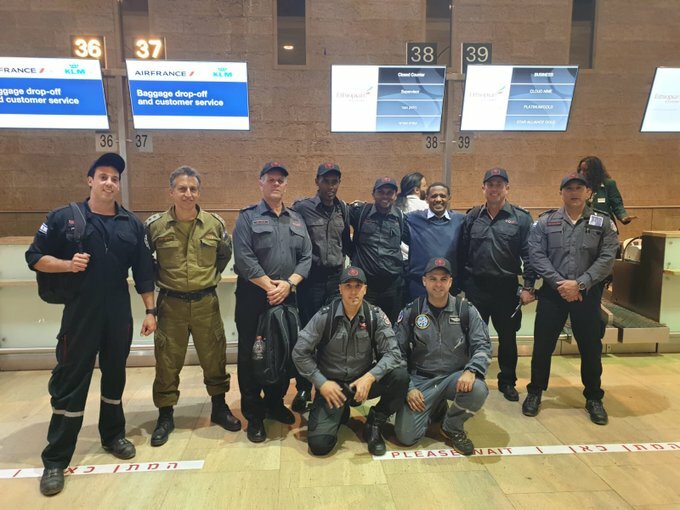 Israeli firefighters are the latest addition to a growing list of experts in Ethiopia to help authorities deal with the forest fire that has hit the Semien National Park in the northern Amhara region. Experts from South Africa, Kenya and France were among the first to offer their assistance as of last week. In an exclusive interview with FBC, Deputy Ambassador of Israel to Ethiopia, Mr. Or Daniely said his country sent the ten-member team based on the request of the Government of Ethiopia. The experts were drawn from the Israeli fire brigade and have high-level knowledge and skills in fighting wildfires, he said. Members of the team have traveled to Debark, and they will provide assistance to Ethiopians who were battling the fire, he stated. The group is being led by Zion Shenkar, who was born in Ethiopia and was the Israel Defense Force’s first-ever battalion commander from the Ethiopian community. The mountains are a World Heritage Site and one of the country’s main tourist attractions. The national park is home to several rare animal species including the Waliya ibex and Gelada baboon.